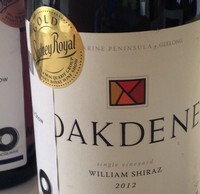 We are pleased to receive two Gold medals in Sydney at the 2014 Macquarie Group Sydney Royal Wine Show, for our ’2012 Oakdene William Shiraz 96 points’ and the ‘2012 Oakdene Peta’s Pinot Noir 95 points’, from the exceptional 2012 vintage. Accepting entries from wines made from all regions of Australia, the Sydney Royal Wine Show offers us a great opportunity to benchmark our wines with some of the nation’s best. The 2012 growing season produced some fantastic fruit across the board at Oakdene, with our reds benefitting most from a long moderate growing season. All fruit is hand harvested and fermented using wild yeast with the addition of 15% whole bunches to enhance perfume and structure then matured in new and seasoned French oak barriques. DIMMI AWARDS - Oakdene Vineyards Restaurant has won two more Dimmi Awards. The restaurant has been selected as Best for Fine Dining (Regional) and Best for Special Occasion for February 2014 in Australia. Voted for by Dimmi diners as part of the Dimmi Score Program, these awards recognise the opinion of over 300,000 diners in Australia. We are pleased to offer the latest vintage of what has arguably become one of the benchmark wines from our region, the Oakdene William Shiraz from the exceptional 2012 vintage. Accepting entries from wines made from grapes grown in the Ballarat, Geelong, Henty, Grampians, Pyrenees, Bendigo and Sunbury regions, the Ballarat wine show offers us a great opportunity to benchmark our wines with some of Victoria's best. At the 2012 Ballarat Wine Show, judged in September last year, our 2012 William Shiraz was awarded Top Gold in its class, Trophy for Best Regional Shiraz, and Trophy for Best Regional Red Wine. The Shiraz then followed up by winning a Gold Medal in the Geelong Wine Show in October. The 2012 growing season produced some fantastic fruit across the board at Oakdene, with our reds benefiting most from a long moderate growing season. Our Shiraz is sourced from two individual blocks planted to clones PT23 and Best's (Great Western) in 2011 and 2002. All fruit is hand harvested, and fermented using wild yeast with the addition of 15% whole bunches to enhance perfume and structure, then matured for 16 months in new and seasoned French oak barriques. The wine is now released and available for tasting in our cellar door, open daily from 10am, or by the glass in our restaurant. $35.00 per bottle/$378.00 per dozen. Oakdene Vineyards Restaurant has won a Dimmi Award for 2013. We've been selected as a 'TOP RATED MODERN AUSTRALIAN RESTAURANT'. This means we've been recognised as one of the top rated restaurants for Modern Australia in Australia. What makes this award even more special is that it's not just the opinion of one person or even a handful of people; this is the collective opinion of over 250,000 diners as part of the Dimmi Score Program. Congrats to all the staff who work tirelessly in the restaurant. The entire team at Oakdene Vineyards Restaurant were delighted with a win in both of its categories in the 2013 Savour Australia™ Restaurant & Catering HOSTPLUS Awards for Excellence – Victoria. The Awards for Excellence are judged by a team of trained judges who anonymously visited the venues to determine the winners. The Awards program recognises the Industry’s commitment to service and quality. Representing Victoria, Oakdene will now compete with venues from across Australia in the National finals, so stay tuned. 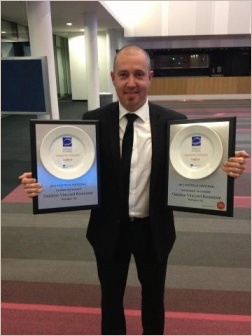 Executive chef Marty Chichester proudly showing Oakdene's two National Awards for Excellence. Iconic Oakdene Vineyards Restaurant has been awarded ‘Best in the Nation’ twice, winning two awards at the 2012 Savour Australia™ Restaurant & Catering HOSTPLUS Awards for Excellence. The Awards for Excellence program has seen its 15th year and the National event is a culmination of winners from 9 events held around Australia, with the National winners being recognised for their outstanding commitment to quality and service at the industry’s gala night of night’s celebration held at Brisbane Convention and Exhibition Centre. Through the RACES Evaluation System, venues were assessed by trained judges who dine anonymously and review the experience according to a predetermined, research-based and standardised set of criteria, making it the only truly systematic restaurant industry awards program in Australia. The judging process provides a benchmark for businesses that are involved and is specifically designed to objectively recognise and promote industry best practice. John Hart, CEO Restaurant & Catering commented, “Restaurant & Catering congratulates all the winners and finalists in the 2012 National Awards. Their achievement in providing great food and great service is in itself, a wonderful contribution to the industry. The Awards for Excellence represent an important moment as the industry pauses to honour these outstanding venues for their great talent, innovation and commitment and to celebrate such well-deserved accolades”. Executive Chef Marty Chichester & Front of House Manager Michael Davis proudly accepted both awards last night, thanking their entire team at Oakdene.